Kind of like if a James Mitchner novel and Diary of Anne Frank were to have a love child on the Korean peninsula. This historic novel reads much more like a historic biography. A definate page turner to the very end. A must read for anyone interested in recent Korean history. Both gut wrenching and compelling I had a very difficult time putting this one down. Vivid descriptions and well-rounded characters fill this heart-warming, tension-filled novel. If you are looking for a war-time novel with ethos and pathos, this book is for you. It is clear to me that so much heart and soul went into this novel. 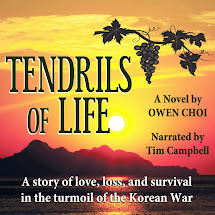 'Tendrils of Life' touched on so many human themes, mostly love and relationships, but also hardships and survival, family turmoil, the horror and tragedy of war, and how greed can destroy us. Owen Choi takes us into his world with fully developed characters that become all too read. 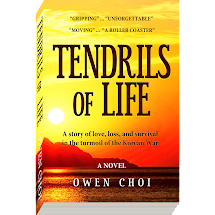 'Tendrils of Life' is Mr. Choi's first novel. I anxiously wait for more!